Heavenly Monkey Editions has just issued The Tale of Three Black Boxes, a book and companion suite of prints by Shinsuke Minegishi. 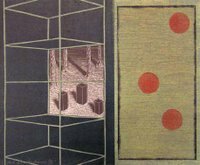 The project merges and juxtaposes Minegishi’s interests in fine printmaking and fine bookmaking, presenting a series of new wood engravings in two strikingly different contexts and formats. 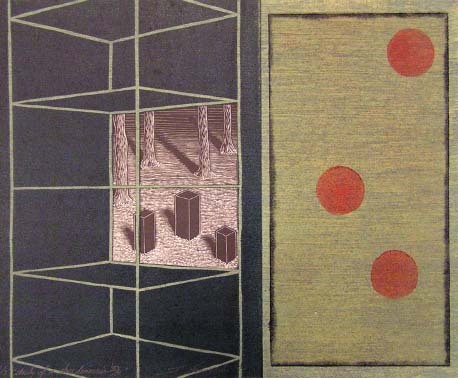 The core of the project consists of six wood engravings (each about 3 inches sq) that tell a sequential narrative about the adventures of three black boxes ("the smallest number a traditional family can be"). This story is told, with spare text, in a single signature book. The text is hand set in Gill Sans and printed on Arches paper with the HM handpress. The engravings were printed by the artist on gampi made in Japan by Shiho Nao, and mounted to the text sheets, which were then sewn into a single signature book with an embossed and debossed wrap. A companion volume holds a suite of six prints that delve more deeply into the specific imagery of each engraving. The prints are multicolor woodcuts that incorporate an engraving, through windows and openings cut into the printed sheet. These prints – along with a title sheet, one-page essay by the artist, and colophon – are held loose in a black portfolio. Both cases are held in a matching slipcase with printed spine label. All cases are made by the artist. The edition is limited to 25 sets, of which five are reserved for distribution exclusively in Japan. The book and portfolio (both 8.5 x 7 inches) in each set feature descriptive colophons, numbered and signed by Minegishi (the book in English, the portfolio in Japanese). 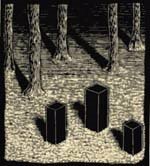 The Tale of Three Black Boxes is Minegishi’s most ambitious publishing project to date, hence the small edition; at the time of publication, just five copies remain available from the publisher. This is HM's second publication for 2006. It was preceded by a checklist of the 17 titles published from 1998 – 2005, and the first ever attempt at recording the studio's ephemera and Christmas books. Two hundred copies of this 8-page pamphlet, printed from polymer plates and sewn in a printed wrap featuring our new press device, were issued in February. This entry was posted on Tuesday, April 4th, 2006 at 5:27 pm	and is filed under Heavenly Monkey. You can follow any responses to this entry through the RSS 2.0 feed. You can leave a response, or trackback from your own site.